The Asia-Europe Meeting has started in Mongolia amidst a terror attack in France, Brexit concerns and South China Sea tensions. German Chancellor Merkel also met with Russia's Medvedev to discuss the Ukraine crisis. Leaders from Asia and Europe began the biennial Asia-Europe Meeting (ASEM) summit in Mongolia on Friday by strongly condemning international terrorism in light of Thursday's attack in southern France. Leaders from 51 countries in Europe and Asia held a minute of silence in the Mongolian capital Ulaanbaatar to remember the victims of a truck attack in Nice. They also released a joint statement where they denounced the "heinous and cowardly attacks" while pledging to fight "the plague of terrorism." Japan's Prime Minister Shinzo Abe said the "despicable terrorism engulfing innocent people can never be forgiven," while German Chancellor Angela Merkel told reporters "we are all united in shock." The meeting followed on the heels of a recent decision over the South China Sea row by the UN-backed Permanent Court of Arbitration (PCA) in the Hague. China had asked leaders not to discuss the tribunal ruling, which decided in favor of the Philippines' sovereign rights to the disputed waters. However, leaders criticized Beijing by emphasizing the importance of respecting global legal frameworks. "Dialogue and a strong commitment to the rules-based international order are necessary," said European Council President Donald Tusk at the opening ceremony. During the PCA deliberations, China refused to take part and called the verdict null and void. The Philippines' Foreign Minister Perfecto Yasay told the summit it "strongly affirms its respect for this milestone decision" but called for "all parties to exercise restraint and sobriety." Japan's Abe encouraged Chinese Premier Li Keqiang to respect the rule of international law during a sideline meeting at the summit, reported Japanese news agencies. Japan, also embroiled in a maritime dispute with China, may serve to benefit from the ruling. Li fired back, saying Japan should "stop hyping up and interfering" in the South China Sea, according to China's Xinhua news agency. European leaders also sought to assure Asia that Britain's pending withdrawal from the EU will not impact the EU's open trade and foreign policy. "The European Union remains an engaged and active global player," said Tusk following a meeting with Abe. "We will continue to do so as an EU of 27 states, once the UK leaves. There is no shift in our foreign policy." In another sideline meeting, Germany's Merkel spoke with Russian Prime Minister Dmitry Medvedev about the implementation of the Minsk peace agreement for eastern Ukraine. 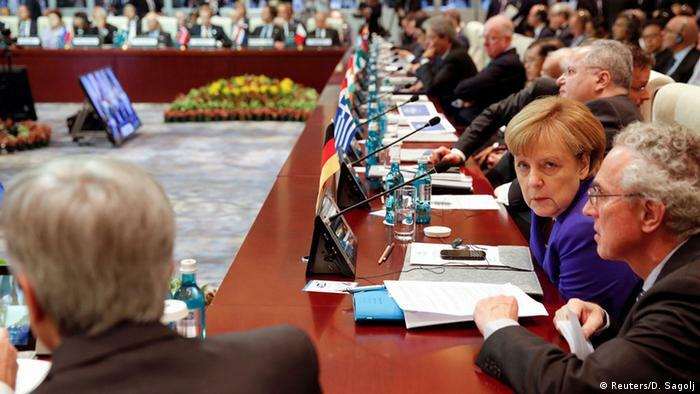 Both the EU and Russia were determined to rapidly implement the agreement, Merkel said following the meeting. She added that doing so would be very beneficial and important for all parties concerned. Despite signing the Minsk peace agreement in February 2015, fighting between pro-Russian separatists in eastern Ukraine and government forces has not stopped. ASEM, which is celebrating its 20th anniversary, is intended to increase cooperation between Asian and European countries.